Just click on the picture or the link on the navigation bar above. 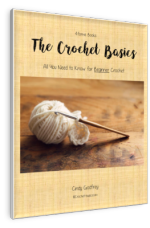 Crochet Essentials are the basics steps you need to begin. Whenever you learn something new, there are always basic principles to get you started. This is where you find those nuts and bolts for crochet. Everyone wants to just pick up that hook and yarn and start crocheting. But learning and understanding the foundation will help you get off on the right foot. Here's what we need to cover. There isn't a lot of crochet supplies needed to get started. This is one of the reasons so many people like this craft. You'll definitely be starting with crochet yarn and a crochet hook. Did you know there are many different varieties and weights of yarn? There are, more than I can even list. What you choose can and will effect your finished project. So take some time and learn about Crochet Yarn first. After you have your yarn, you'll be choosing a hook. Learn about the types and sizes of Crochet Hooks before you begin. You're just about ready to start. Here's a few more helpful Crochet Supplies that can help you through your project. Just thinking about Reading Crochet Patterns used to make me dizzy. The explanations were confusing to me and hard to understand. That didn’t help me want to put my energies into learning them. But, it’s easier than you think. Yes, there are lots of terms, abbreviations and symbols –don’t let them overwhelm you. The key is to take your time. You don't have to learn them all at once. But, familiarize yourself with them. don't just skim over the information. Make sure you understand them the best that you can. And, don’t worry about the ones that are a little more confusing. As you learn the actual stitches, the abbreviations and symbols will become clearer. Now it’s time to pick up that hook and yarn. Everything you’ll need to know for pretty much every project you’ll ever make is right here. So, it’s important to get it right. Crochet Basics . . .
Continue with these . . .
Chain Stitch --This includes Slip Knot and Yarn Over. Slip Stitch -- This includes Fastening Off and Turning Chains. You're getting the basics down. Here's a few more important techniques and skills to learn. Crochet help offers additional skills and techniques to your crochet essentials. These will definitely help you be more successful with your crochet projects. Recognizing the front from the back of your work will be important. You'll find some help doing that here. We'll also talk about Extra Loops. They're created when you crochet in the front or back loops of your chain. They can add texture to your projects. Sometimes you'll come back and crochet new stitches in the extra loops. Some patterns also call for you to work around the front or back posts of the stitches in the previous row. This will add texture and patterns in your work. It's necessary to block your crochet projects. Blocking is a technique used to reshape your piece after it's washed or to give it a sharper, cleaner look. Felting is a technique used to finish your work. It's used with wool yarn to give it a softer, fuzzy look. All of these skills will help you succeed later on and make your projects go smoother. It’s worth your time to learn these now. At one point or another, you'll be Joining New Yarn. It might be to add a new color or maybe just to start a new skein. Learning the right way to start new yarn will give your work a cleaner look. You'll be happier with your results, I promise! Crochet Seams are an important part of crochet. Some projects will be worked all in one piece but others are made in separate pieces. These will need to be sewn together. There are several different ways to make these seams. This is where you can learn about them. Learning how to crochet a circle is so important. Lots of patterns are crocheted rounds. So, it's a technique you will definitely need. 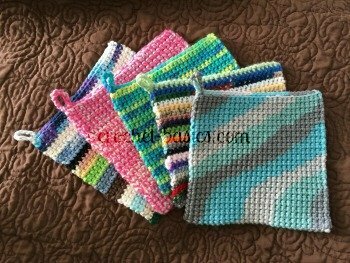 The best time to to begin crocheting circles is after you have learned all the crochet essentials and your crochet stitches. While crocheting circles, you'll use all the skills you've already learned, except some will be used in slightly different ways. Once you’ve learned these crochet essentials, you’ll be ready to learn your stitches and start your first project. You can do this! You can learn how to crochet! And, more importantly, you’ll learn to love crochet! Start learning your Crochet Essentials here! Sign up for our newsletter and you'll be up to date on all the latest buzz. 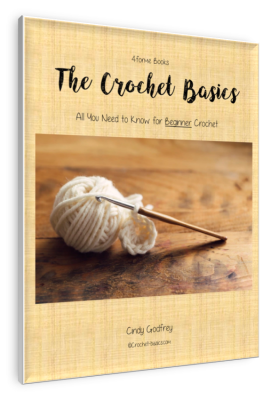 The crochet basics shop is where you can purchase e-books, patterns and supplies. You'll love this little crochet hat pin-cushion pattern. It's simple and fun and makes a great gift. You'll love this crochet coaster pattern. It's quick and easy and lots of fun. Nothing on this page is public domain.